ROOKIE sensation Eya Laure was glad to fulfill her promise to graduating teammate Sisi Rondina of reaching the Final Four in UAAP Season 81 women’s volleyball tournament. 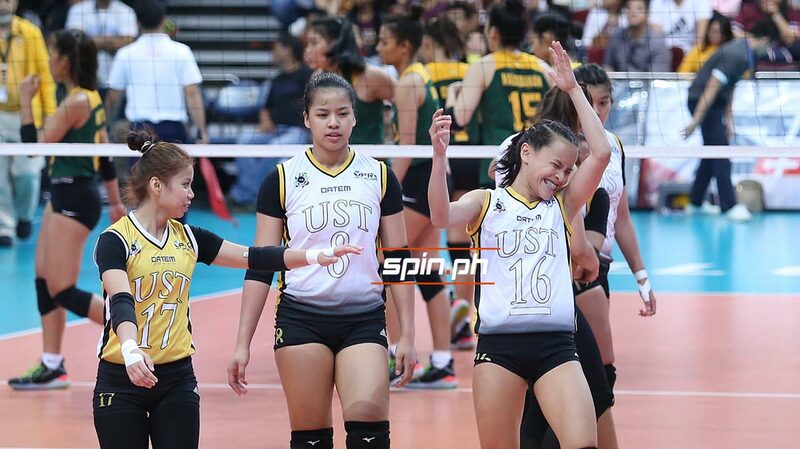 Since the offseason, Laure has been expressive on how she badly wants to give Rondina a fitting end in her five-year UAAP career by redeeming UST from a dismal seventh-place finish last year. The rookie fulfilled her promise to her team captain as UST returned to the Final Four by beating Far Eastern University, 25-23, 25-18, 25-23, paired with UP’s earlier five-set loss to NU that completed Final Four cast on Sunday at the MOA Arena in Pasay City. “Para sa akin, happy din po. Nakeep ko yung promise kay ate Sisi,” said Laure, who combined for 38 points with Rondina. UST also kept its hunt for a twice-to-beat advantage claiming the solo third place with a 9-4 win-loss record just half a game behind second placer De La Salle (9-3). Besides Rondina and other graduating teammate Rica Rivera, the 20-year-old rookie is also dedicating this season to injured teammate Milena Alessandrini, who didn’t finish the season due to a torn ACL, and also to her elder sister EJ Laure missing two seasons due to a shoulder injury. But it’s just step one of her goal as Laure seeks to build her character for her to help Rondina in her second and last Final Four appearance. The rookie sensation will make the most out of their long Holy Week break as she braces for her first Final Four appearance in the collegiate ranks.